OARDC will play a key role in the engineering of a novel plant-based fuel, funded by a $5.7 million grant from the U.S. Department of Energy. The grant, awarded by DOE's Advanced Research Projects Agency-Energy (ARPA-E) under the Plants Engineered to Replace Oil (PETRO) program, includes a $1.2 million subcontract to the center. Leading the project is Chromatin Inc., a Chicago-based developer of energy-crop feedstocks. Other partners include San Diego-based Allylix and Kansas State University. The three-year project, titled "Plant-based Sesquiterpene Biofuels," involves the production of a hydrocarbon from two drought-tolerant plants: guayule, a woody shrub native to the southeastern U.S. and Mexico; and sweet sorghum, a crop similar to sugar cane that is grown in southern U.S. regions. This hydrocarbon can be easily extracted and cheaply converted into a renewable transportation fuel. OARDC's role in the project involves the engineering of these two crops at the genetic level so they can boost the production of farnesene, a natural plant oil that can be converted into a diesel-like fuel. Farnesene is one of many sesquiterpenes, compounds that are associated with essential oils and resins in plants. 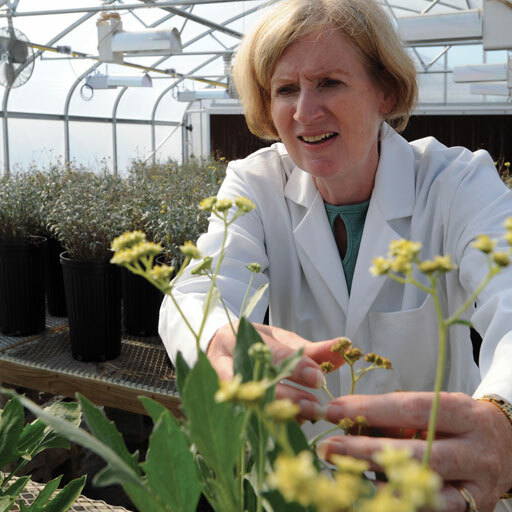 "We will use guayule as a model to study and perfect production of the farnesene molecule inside the plant," said Katrina Cornish, Ohio State's endowed chair in bioemergent materials and a guayule expert. "Guayule is a very good model because it already produces and stores a lot of hydrocarbons in the form of resin in its stems and branches." A commercially grown source of hypoallergenic latex, guayule produces both rubber and hydrocarbon-rich resin. Cornish and colleague Josh Blakeslee, an OARDC biochemical physiologist, will genetically manipulate this plant so that it diverts more resin into farnesene. As this model is optimized, research partners at Chromatin will be simultaneously applying it to sweet sorghum to try to yield the same results. "Sorghum makes very little of this hydrocarbon naturally," said Blakeslee, an assistant professor in the Department of Horticulture and Crop Science. "So the overall plan is to engineer the plant so that it diverts carbon from energy stores of sugar into farnesene. This is accomplished by activating the isoprenoid synthesis pathway, which is responsible for making more of this hydrocarbon in the plant." The project's goal is to have guayule and sweet sorghum engineered to produce an estimated 20 percent of the plant's dry weight as farnesene, which is then extracted and hydrogenated to farnesane fuel.